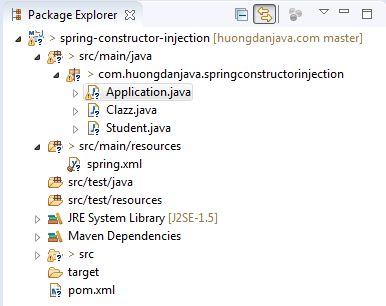 In previous tutorial, I introduced with you all basic knowledges about Constructor Injection in Spring using XML file. In this tutorial, I will show more information about it to hep you can use it easily! As you see, class Clazz defined a constructor with 2 arguments, one is Student object and other one is a variable type String. These arguments are dependency objects, so how can we inject these objects into Clazz object using this constructor? In this declaration, I used <constructor-arg> tag with the attribute value to assign the value to name variable. This <constructor-arg> is used to define for the arguments in the constructor of the objects in Spring container. It has a lot of attributes but there are 2 common attributes is value and ref. The value attribute is used in-case the ingested value is a text, a number, a boolean value,… The ref attribute is used to refer to another bean that has been initialized in Spring container. OK, we just done declaration Student object, now we will continue with Clazz object. Value of index starts from 0. Beside that, instead using <constructor-arg> tag, Spring also supports us another simple way to work with Constructor Injection. 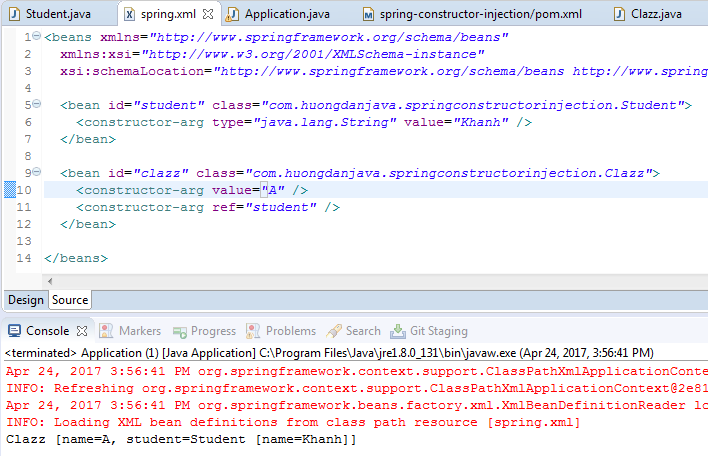 That is: using the namespace c, xmlns:c=”http://www.springframework.org/schema/c”. then using following syntax to inject the dependency objects.